Toroid Coils are a closed-loop core. Toroid Coils have many benefits over other shaped cores. Many of the benefits are due to the winding aspect. Toroid core winding provides excellent benefits that make them ideal. Compared to other shaped cores, toroids work incredibly well with power devices. Being compact and lightweight is it what makes them so beneficial. Toroids have a much higher inductance and Q factor than a conductor of the same value with a straight core. The higher inductance and Q factor can be attributed to the toroids shape. The closed-loop core will have a larger magnetic field which results in the higher characteristics. 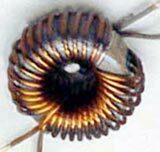 For toroid coils, the magnetic field is contained within the core. There is a magnetic field emerging from one end of the core to the other end of the core in inductors with a straight core. These ends have a long path through the air. Toroids also have a lower secondary impedance. The lower secondary impedance will increase efficiency and electrical performance. This characteristic can be attributed to the short windings. A toroidal conductor radiates less electromagnetic interference than other shaped cores. Because of the symmetry of the toroid, little magnetic flux escapes from the core, which is known as leakage flux.